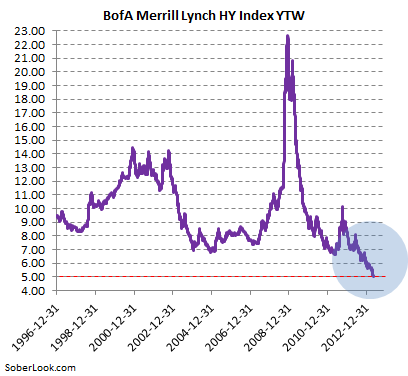 Sober Look: Bernanke signals the Fed is uneasy with "reaching for yield"
Bernanke signals the Fed is uneasy with "reaching for yield"
As Merrill's junk bond index yield crossed the historical low of 5% on Thursday, some senior Fed officials are clearly becoming uneasy. Corporate credit markets are entering bubble territory (see discussion) and up until recently very little has been said on the topic by the US central bank. On Friday Ben Bernanke sent a signal to the markets that the Fed is watching the "reaching for yield" situation "particularly closely". Ben Bernanke (May 10, 2013) - ... We follow developments in markets for a wide range of assets, including public and private fixed-income instruments, corporate equities, real estate, commodities, and structured credit products, among others. Foreign as well as domestic markets receive close attention, as do global linkages, such as the effects of the ongoing European fiscal and banking problems on U.S. markets. Not surprisingly, we try to identify unusual patterns in valuations, such as historically high or low ratios of prices to earnings in equity markets. We use a variety of models and methods; for example, we use empirical models of default risk and risk premiums to analyze credit spreads in corporate bond markets. These assessments are complemented by other information, including measures of volumes, liquidity, and market functioning, as well as intelligence gleaned from market participants and outside analysts. In light of the current low interest rate environment, we are watching particularly closely for instances of "reaching for yield" and other forms of excessive risk-taking, which may affect asset prices and their relationships with fundamentals. It is worth emphasizing that looking for historically unusual patterns or relationships in asset prices can be useful even if you believe that asset markets are generally efficient in setting prices. For the purpose of safeguarding financial stability, we are less concerned about whether a given asset price is justified in some average sense than in the possibility of a sharp move. Asset prices that are far from historically normal levels would seem to be more susceptible to such destabilizing moves. The chart below must give at least some US central bankers a reason to reflect on the current pace of monetary expansion. What "unusual patterns in valuations" will another $1.5 trillion of securities purchases create? The FOMC is likely to have at least some debate on the topic at the next meeting.